states, NY and VA, that voted for Clinton in 2016.
are taking the brunt of GM's layoffs. The following is posted by permission of Dana Chasin, who sent this out as Update 314 to his list, under the title: "An Economy Shifting Gears: What do Amazon's new HQs and the GM Layoffs Portend?" GM's layoffs and Amazon's new headquarters expansions show that Trump's bets on revival of car manufacturing, as opposed to embrace of technology, are not paying off. States that voted for Clinton in 2016 are winning and two states that believed in Trump's promises for manufacturing are losing. Trump's beggar-my-neighbor tariff policies are not helping American manufacturing. In an equally important but opposite development yesterday, General Motors announced its plan to eliminate up to 14,000 jobs in five plants in three states and Canada. Three of the plants are in Michigan and Ohio, which voted for Trump after campaign promises to revive manufacturing. GM's surprise decision has rattled the Trump Administration and Republican leadership, challenging the belief that the economy is running fine on high octane fuel and should continue unfettered. GM’s announcement comes less than two years after it announced it would add or keep 7,000 jobs in the United States. It translates to an expected loss of 14,700 jobs. The decision comes only a month after GM offered buyouts to as many as 18,000 long-time employees, only 4,000 of whom accepted the offer by the November 19 deadline – 3,000 employees short of its 7,000 target. With the buyout program behind schedule, the decision to idle five facilities did not come as a surprise to many. The Lordstown assembly plant in Warren, Ohio, for example, had gone from three shifts per day in January 2017 to one shift this past April. The United Auto Workers said it would challenge GM’s decision. If GM still hasn’t reached its 7,000 buyout goal by January, further involuntary cuts are likely. While the Tax Cuts and Jobs Act (TCJA) of 2017 purported to create record tax windfall for corporations to reinvest, the picture with GM is more complicated. In GM’s case, the TCJA did not account for “deferred tax assets” which the company was able to accumulate due to poor performance predating the Great Recession. These assets allow companies to reduce taxable income, meaning GM had already been afforded a low tax bill for over a decade. The newly reduced corporate tax rate therefore rendered these assets less valuable, forcing GM to take a $7 billion charge against earnings during the fourth-quarter of FY 2017. Executives expected to see an eventual benefit from the new tax law, but not for years to come. It’s hard to claim that in absence of sizable deferred tax assets, GM would have even used their $157 million in federal savings to support American plants and employees. An October survey published by the National Association for Business Economics reported 81 percent of 116 companies surveyed had not changed plans for investment or hiring as a result of the TCJA. July 25, 2018: GM was forced to reduce its profits forecast for 2018, tanking stock by 4.6 percent. GM’s CFO predicted the original tariffs in March and the ending of exemptions to the US’s most trusted partners in June could add “as much as 700 million to GM’s costs” for FY 2018. September 24, 2018: The White House compounded the problem by unveiling a new, stringent set of tariffs on Chinese automotive exports, putting in place a 10 percent levy on brakes, car batteries, tires, etc. Analysts predict these new tariffs will lead to higher sticker prices for cars and lower car sales. GM, like all other US car manufacturers, relies on foreign-based subsidiary plants and goods to create finished products, making broad tariffs doubly damaging to an already wounded industry. With GM historically leading the way in moving jobs to Mexico and a less favorable domestic/international tax rate differential introduced in the TCJA, the Trump administration's tariffs have only produced escalated offshoring. He blamed past factory closures on Democratic failures and promised not to let that happen again. The GM decision reflects the fecklessness of Trump’s approach. Many voted for him because of his pledge to save the manufacturing industry. Instead, he has put forth policies that undermine that goal and expose fears that become self-fulfilling trade prophesies in the form of retaliation. Plants will be closing in two states that were key to Trump's victory – Michigan and Ohio. The GM closures thwart his guarantees to protect manufacturing and undermine his portrayal of a healthy economy that is growing with no end in sight and equitable for minority groups. 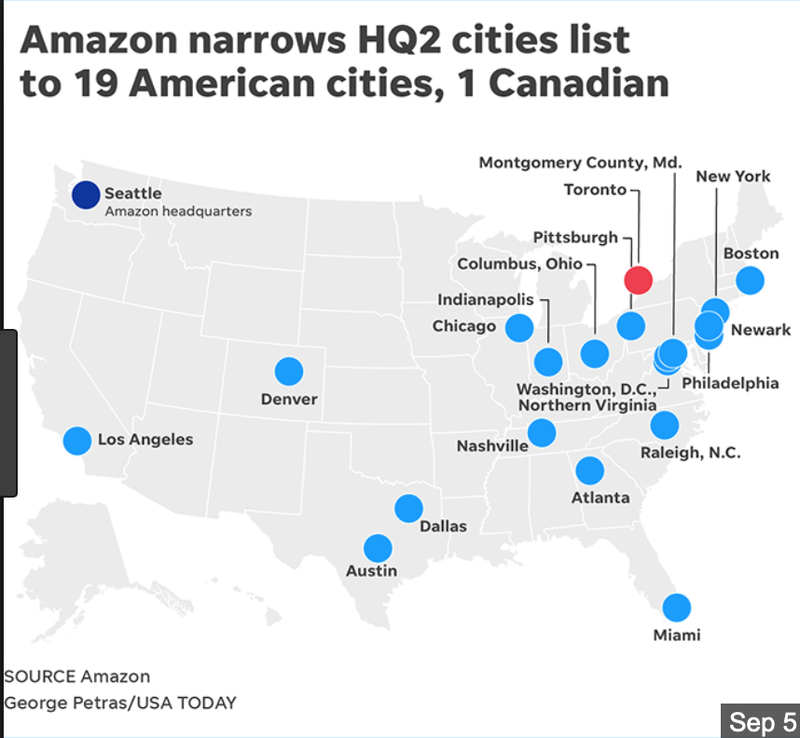 Almost simultaneously, Amazon announced its locations for its new HQ2. After a country-wide tax benefit bidding war, it has pledged to bring 25,000 jobs to both New York and Virginia, as well as an estimated 67,000 and 22,000 indirect jobs to each respectively. Will this model work? Amazon is encouraged to fulfill its jobs promise through "performance-based direct incentives," meaning that for each pledged job that comes to fruition, they get a certain amount of tax breaks. This kind of city and state tax break is by no means an uncommon way of driving business to invest in a given area, and has been utilized in the past by other tech company giants, such as Google. Although the model has proven very effective at creating jobs, there are some accompanying flaws. In Seattle, Amazon’s first HQ brought an economic boom and more than 40,000 jobs to the city; it also cost taxpayers hundreds of millions of dollars in ongoing infrastructure and transportation upgrades around the site, while neglecting other areas of the city. Affordable housing underwent a serious crisis. However, Amazon has worked with Virginia and New York governments to try and get in front of some of these issues, pledging money for additional schools and low-income housing. Moreover, Arlington and Long Island are not Seattle. Bringing 100,000 jobs to these areas is a boon even to these booming coastal metropolises. Trump has criticized Amazon repeatedly in the past and again following the announcement of HQ2. The economic tide seems to be working against him – 44 cents of every dollar spent online goes to Amazon. As much as Trump wants new jobs in the manufacturing sector, the evidence shows that the tech sector is the one to watch. Tech jobs offer the same, if not better, benefits as traditional manufacturing jobs, such as 401ks for salaried workers. States are quite literally fighting over these Amazon jobs, whereas auto-manufacturing jobs in the rust belt have become more burdensome than beneficial. Even GM will be using its hefty savings to further bulk up its electric and autonomous vehicle development through R&D programs that already see more than $1 billion a year in company investment. Trump can no longer keep up the facade of a booming economy fueled by the manufacturing industry, and his supporters, especially those in Michigan and Ohio, must adjust to these false hopes and broken promises.